Traditionally, law enforcement officers have a highly ingrained sense of honor bound duty to assist each other during times of crisis. We normally see this exemplified in the performance of their daily duties, wherein they routinely risk their lives to protect citizens and fellow officers. Unfortunately, they are often called upon to make the ultimate sacrifice of their lives, unselfishly for those they are sworn to protect. Such actions are accepted as routine by those officers who make up the “Thin Blue Line” which protects this nation. For many years, we have characterized law enforcement personnel as both: the “Thin Blue Line” and the “Centurions”, for these valiant qualities. Each officer is especially bound inextricably to risk all for each other, regardless of the consequences. At the Northeast Mississippi Law Enforcement Training Center (NEMSLETC), in Corinth, Mississippi, the “Thin Blue Line” and the “Centurion’s Helmet” are part of the center’s emblem, heraldry and core values. Recently this pride in service to our community and to the “Family of Law Enforcement” took a new twist. Both Mississippi and Alabama were struck by a series of vicious tornadoes in late April 2011. Loss of lives plus property was horrific in the resulting devastation which these areas faced. In an effort to be of service, a former Birmingham Police Officer, Frank Erwin, now Executive Vice-President and Managing Officer of Valley Operational Wear, a personal body armor manufacturer, located in Clinton, Tennessee reached out to Bowen Johnson, Director of the NEMSLETC, Corinth, Mississippi and offered to supply replacement personal armor to those officers whose armor had been destroyed during the tornados. As it turned out, Bowen Johnson and Frank Erwin had known each other for almost fifteen years and at one point had worked together. It must be recognized; Frank Erwin’s offer of replacement personal armor was made with no thought of compensation to Valley Operational Wear and was meant only as a goodwill gesture from a former law enforcement officer to his extended family of the “Thin Blue Line” in Mississippi and Alabama. To locate Mississippi officers in need, immediate liaison was initiated with the Police Benevolent Association (PBA) in Mississippi. Through the efforts of Tommy Simpson, Executive Director of the Mississippi PBA, he determined Darwin Hathcock, Chief of Smithville, Mississippi Police Department was the only officer in our area whose personal armor was destroyed. When asked to exchange his destroyed personal armor for the new armor, Chief Hathcock noted the tornado had blown his armor, along with other items so far away, they had never been recovered. Considering the circumstances, arrangements were immediately made to replace the Chief’s missing armor, without exchange and at no cost due to the relationship established with Valley Operational Wear. 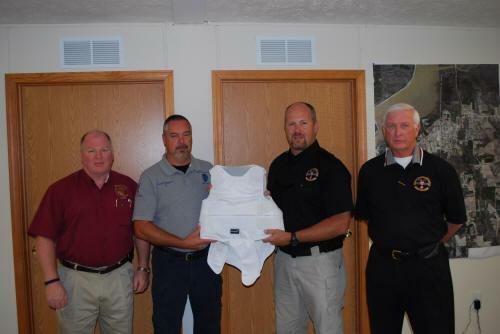 On Thursday, June 30, 2011, the new personal armor was presented to Chief Hathcock by Leonard Prien, PBA’s Field Representative, Captain Chuck Hinds, NEMSLETC”s Operations Officer, plus Membership Chairman of PBA’s Stateline Chapter and Bowen Johnson, Director of NEMSLETC. Once again, law enforcement officers stood shoulder to shoulder as a “Thin Blue Line” to protect each other and be better prepared to serve our citizens.